FabScraps continues to surprise me with each new collection release - each one so completely different from the last. This is a soft and adorable release and perfect for all those baby projects you need to start. Well at least I need to start! I have a few baby events coming in the coming months and I'd love to give the new parents something created from my heart. What could be better? 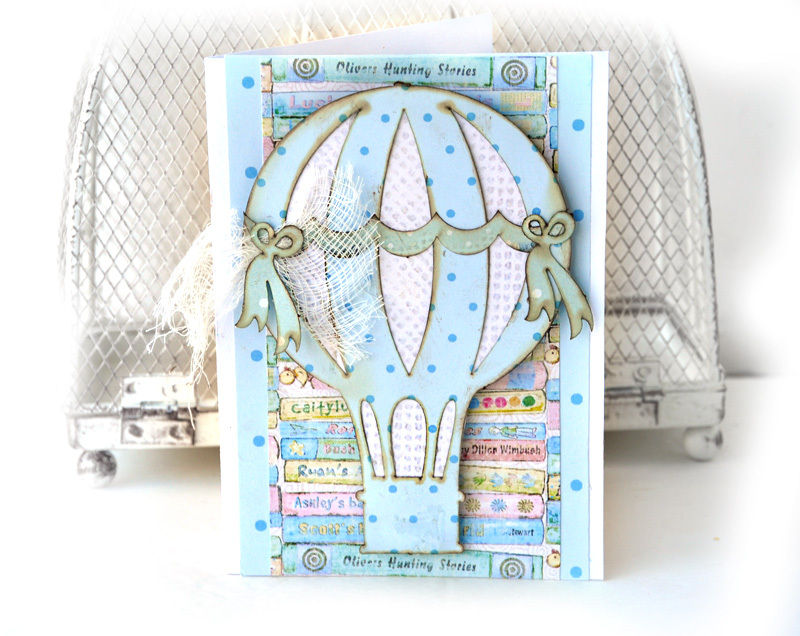 This card features the fun chipboard pieces that FabScraps has in this collection. I used crackle medium for some added texture. The features FabScraps very cool die cuts. They have wonderful die cuts that coordinate with the paper collection. I added cardboard behind the diecut balloon for some dimension. Pre-folded card base 4in x 5.5in – or cardstock to fold into a card of similar size. 2. Starting with a pre-folded card or folded cardstock size 4in x 5.5 in, ink all edges with soft brown vintage ink. 3. Cut piece from FabScraps Royal Baby Collection Baby Books paper C70003 to cover the front of the card, Approx 3.5in x5.5in in size. Ink and glue down. 4. 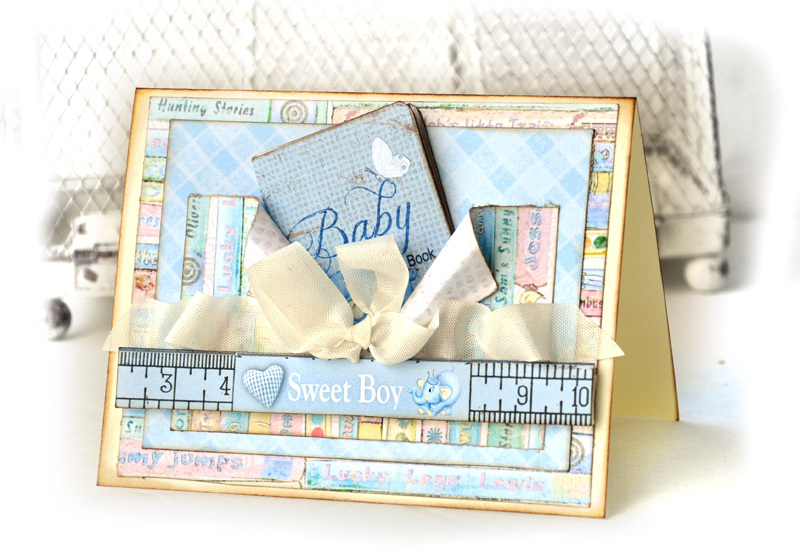 Cut piece from FabScraps Royal Baby Collection Baby Boy paper C70005 as the next layer of the card,. Approx 3in x5.5in in size. Ink and glue in place. 5. Cut piece from FabScraps Royal Baby Collection Baby Books paper C70003 as the third layer of the card,. Approx 2in x 4in size. 6. You need to create a little peek-a-boo window in this step which will hold a mini book assembled in step 9. Holding the paper lengthwise, rip a little of the paper down the center and roll each end over -DO NOT rip in half completely!– glue the ripped flaps in place. Ink and glue in place. 7. Select a “ruler strip” from FabScraps Royal Baby Collection Journal Diecuts MC7001A, ink edges with vintage brown ink, add foam tape for dimension to the ruler strip and glue to the card. 8. Top the ripped peek-a-boo section with a white bow. 9. Assemble the mini book from FabScraps Royal Baby Collection Journal Diecuts MC7001A, ink edges with vintage brown ink. Glue together and inset into the peek-a-boo book holder. 11. Starting with a pre-folded card or folded cardstock size 4in x 5.5 in. I used a white card as my base. 12. Cut piece from FabScraps Royal Baby Collection Baby Books paper C70003 to cover the front of the card, Approx 3.5in x5.5in in size. 13. 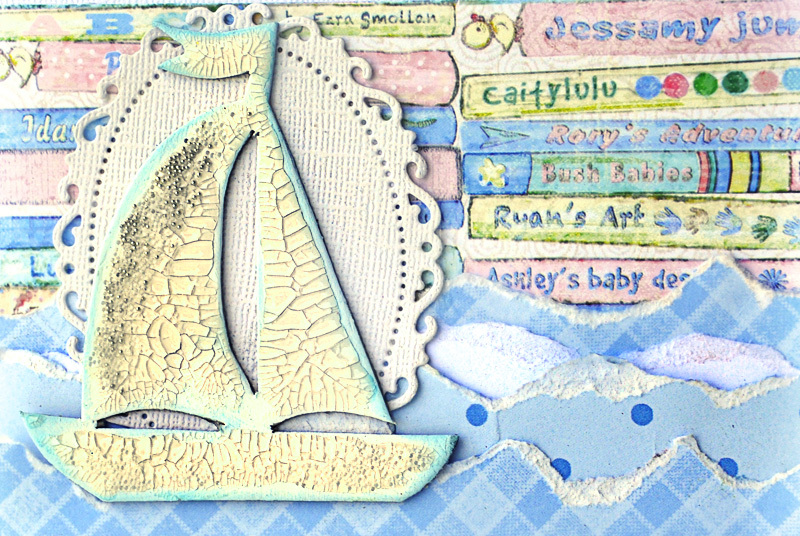 Create the appearance of waves on the card by ripping 5in long thin pieces from FabScraps Royal Baby Collection Baby Boy paper C70005 , FabScraps Royal Baby Collection Blue Ellie paper C70006 and white cardstock. 14. Glue them alternately onto the bottom of the card for waves. 15. Glue ivory oval diecut to the left side of the card like a sunrise. 16. 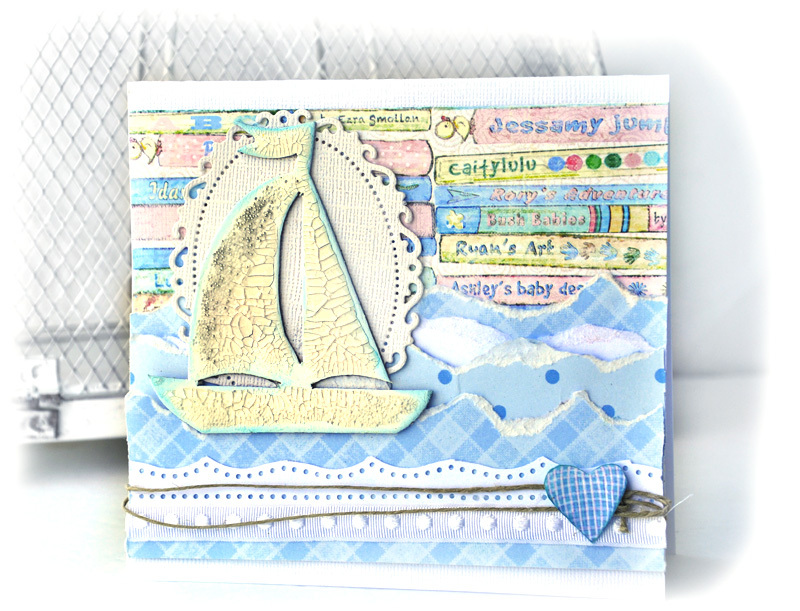 Prepare FabScraps Royal Baby Collection – chipboard Yacht DC70016 by painting white. Apply crackle medium to chipboard. While crackle medium is wet, sprinkle silver micro beads to the sails. Let dry. 17. Lightly ink the edges of the chipboard Yacht with blue ink. 18. Glue on top of the oval diecut. 19. Punch decorative edge using white cardstock. Should be .5in wide x 5in – glue to bottom of card. 20. Glue white trim to the bottom of card. 21. Wrap hemp cord/ jute cord around bottom of card. 22. Top hemp cord knot with a heart cut from FabScraps Royal Baby Collection Baby Boy paper C70005. 24. Fold piece of white cardstock 4.5in x 6.5 in. 25. Cut piece from FabScraps Royal Baby Collection Blue Ellie paper C70006 – 4in x 6.5in. Glue in place. 26. Cut piece from FabScraps Royal Baby Collection Baby Books paper C70003. Approx 3.5in x 6.5in in size. Glue down as the second layer. 27. 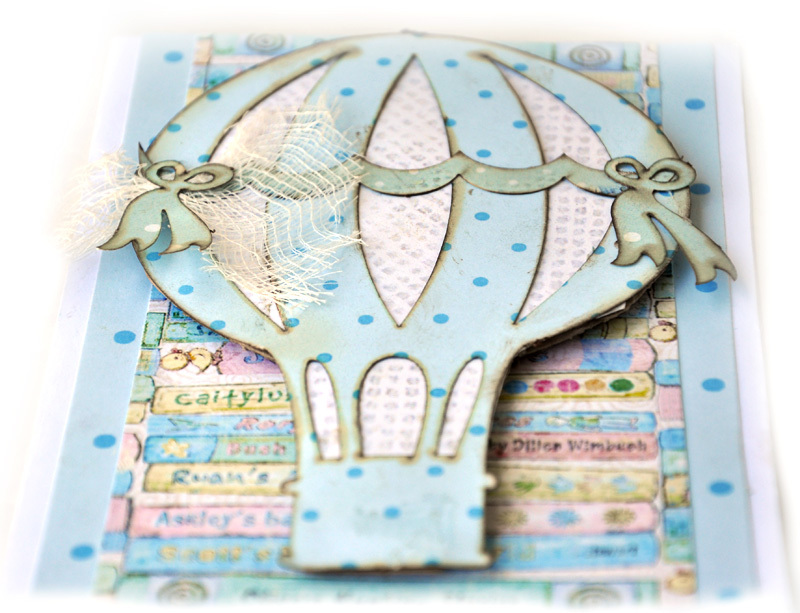 Select a “balloon dicut” from FabScraps Royal Baby Collection Journal Diecuts MC7001A, ink edges with vintage brown ink, and cover the back with FabScraps Royal Baby Collection Baby Books paper C70003 . 28. Add foam tape for dimension to the balloon and stick on card. 29. Select balloon decorations (banners and bows) from FabScraps Royal Baby Collection Journal Diecuts MC7001A . Glue in place. 30. Add small piece of wispy cheesecloth under one bow for the feel of clouds and gentle breeze.